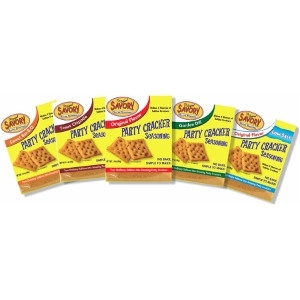 Don't overlook the tasty Savory Cracker mixes that are so easy to grab and go! East River Nursery has so many flavors for you to choose from! Original flavor is the most popular. It has a bold, unique taste – without being too hot or spicy. Most often described as “AMAZING!”. The subtle hints of lemon, vinegar and dill combine to make this lightly tangy and refreshing dill flavor. Garden Dill is a great flavor to serve with fresh vegetables and also compliments seafood. Texas Chipotle is a bit “spicier” than our Original, but the perfect balance of smoky heat and bold flavor. The mild chipotle pepper mixed with special seasonings create this distinctive smoky flavor. This great combination of Savory seasonings create a bold, unique flavor – without being too hot or spicy. The newest Sweet Bar-B-Q has some sweet and sass rolled into one. Each Twin Pack Box includes 2 of each: Seasoning, Oil and Mixing Bags. Now you have the choice to make 2 sleeves or 4 sleeves of crackers. Perfect for holiday gifts, travel and convenience. Just add a box of crackers and you have everything you need.